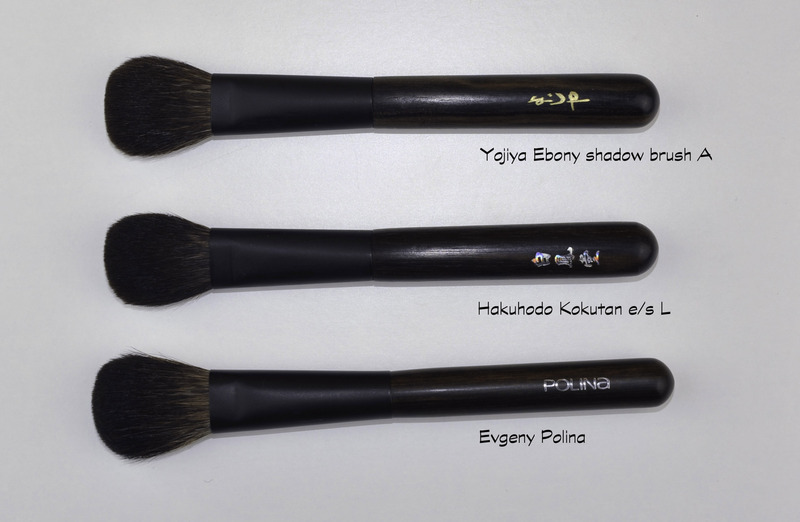 I first heard of the Yojiya brushes thanks to your comments, they looked suspiciously like Hakuhodo Kokutans but I thought they couldn’t be as good. 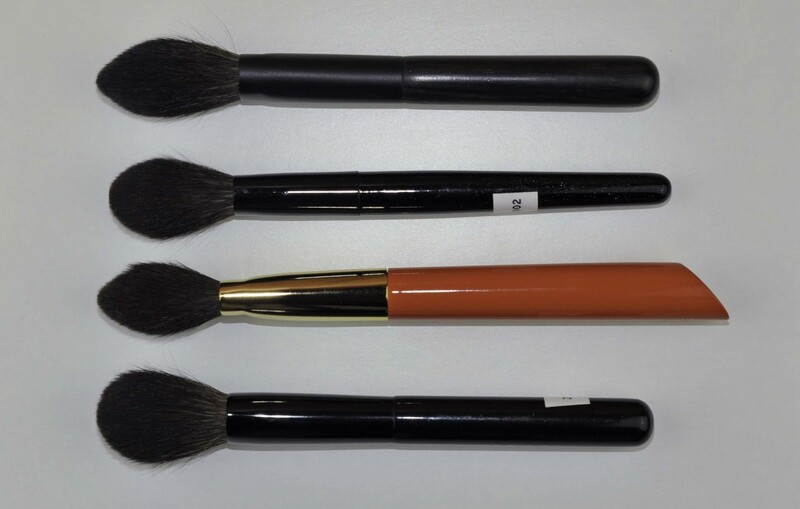 Some brands have their brushes made by a brush manufacture and in some cases they may not differ a lot from already existing brushes, that is done quite often actually, sometimes they do not want to disclose who they work with for contractual reasons and I understand that. So let’s just compare them without making speculations 🙂 Are they as good as Hakuhodos Kokutans ? yes they definitely are, I am even tempted to say they are better – for the similar ones I own. So.. there I am, in front of their shop, just one pedestrian crossing away… how exciting is that ? 😀 Shall I run or shall I not ? Considering I was feeling sick, I didn’t run. 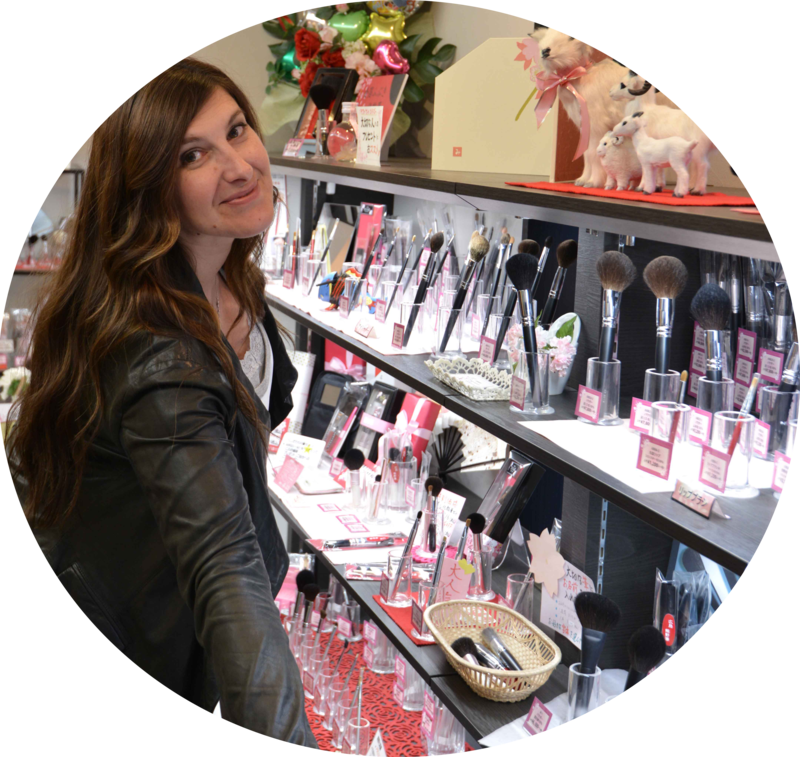 I entered their shop, it was packed, so many people it was difficult to walk around and swatch their blushes, eyeshadows or powders. After a while I could move around easily and approach the items. I spent a long long time swatching everything, playing around with the makeup but I could not spot their brushes at all. Then I saw stairs, went to the second floor and here they were ! a long counter where they all were nicely presented, clean and pristine. The sales assistant came to check out if I needed help, she wasn’t pushy at all and she even let me play alone for a very long time. I was hit by lightning when I saw the blush brush ! that one had to leave with me no matter what. I was very pleasantly surprised with the quality of all of them, but this blush brush was just too good to be true. I knew I would be leaving with it, for the others it was a question of filtering, due to budget and reason, because I really didn’t need them since I had very similar ones. I will briefly share my thoughts on the ones I chose and tell you why I did. I am travelling and I don’t want to wait 2 more weeks that I am back so the review will be short but it will already give you an idea of what to expect. If you have any questions, don’t hesitate to ask. Forgive my naming of the brushes, since I have no clue how they are called, I just opened the Yojiya website and let google chrome translate for me, even though it sounds weird at least if you do the same you will find the corresponding ones 🙂 If you click on the titles it will take you to the website. This is the one that had to leave with me no matter what. Unique shape, the head is longer than other blush brushes, if you had to pick only one from their collection, I would definitely recommend you this one. It’s around 60usd, totally worth its price. It has a tapered rhombus shape if you look at it sideways. In terms of softness, it reminds me when you cuddle a cat, you cannot feel “each hair” but you feel a velvety layer of hair very nicely assembled together, a dream. The other brushes pictured with it here are also excellent but this one feels even finer. It has a particular movement behavior probably due to how the bristles are bundled and to how fine they are, it’s more harmonious and that’s what makes it so unique, the shape, the softness and the movement. 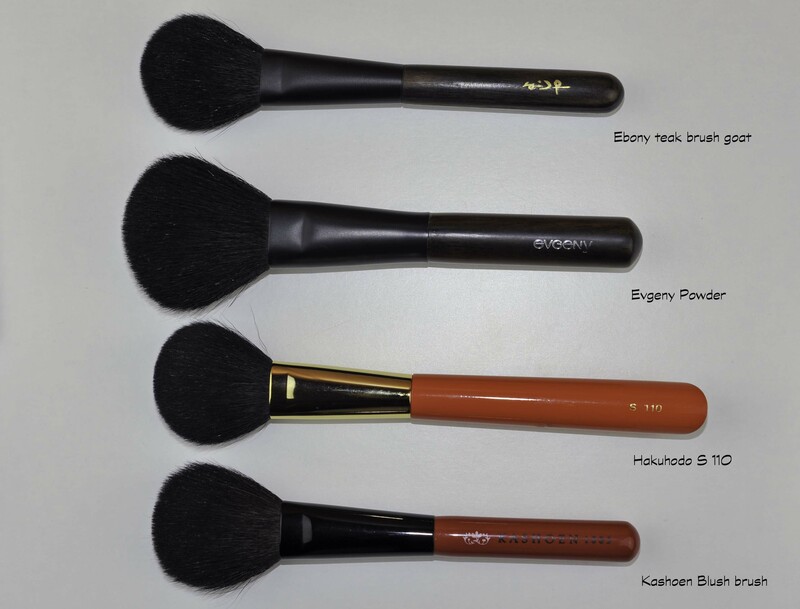 It has similar firmness than the Z-4, if you apply your blush in a round motion the Z-4 is more for you, if you like to pat or paddle, the Yojiya is more for you. Although I prefer round flat brushes for blush I am LOVING this one, it allows great control with precision, depending on how you hold it, it can deliver more or less color, it’s just a matter of trying different techniques. It’s denser and firmer than the Koyudo red blush brush here, it does apply blush more heavily than the Koyudo and it also has more blending capabilities, we are talking about extremely soft brushes here so when I say “heavily” it still is soft and natural. 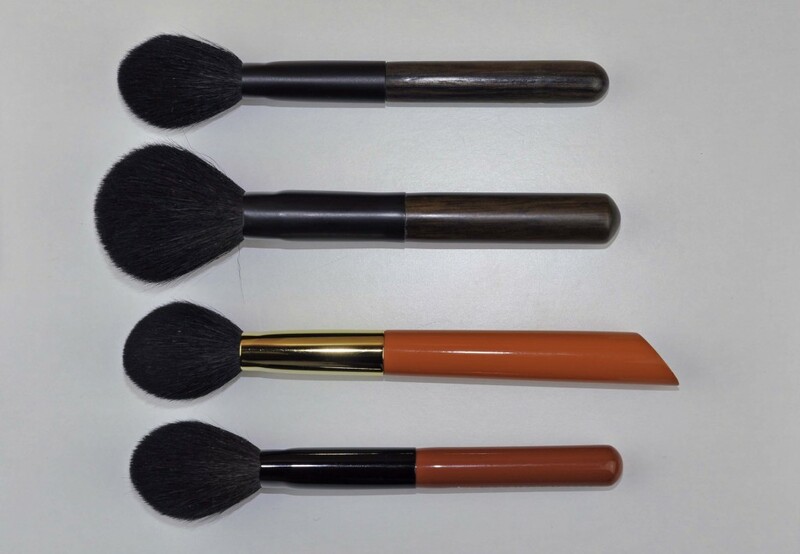 In the picture below, you will see very soft blush brushes, all of extremely high quality, they will all surprise you regardless of the one you chose. 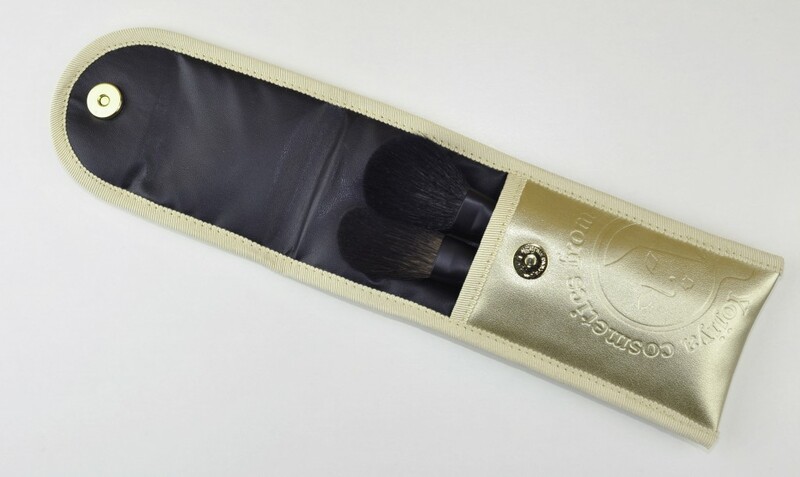 The goat hair used with the Yojiya brushes is soft enough, not as soft as what we call a Koyudo “baby chest goat hair” if you see what I mean but nice quality goat hair. It doesn’t poke but if you have delicate skin you better pick the other squirrel brush above, I can use it without problems but I will apply blush gently and not rub my cheeks with it repeatedly. It’s slightly softer hair than the Evgeny goat powder brush. The Kashoen is more flexible and feels softer. This goat brush will deliver a more polished effect and will do the job very efficiently. When I am in a hurry and don’t have skin problems I prefer to grab for goat brushes. It will depend also on the blush I use, if it’s a Chanel JC or a very sparkly one, I just simply prefer to use goat, it gets rid of the too many sparkles and the powdery effect more easily. Even though I had the Hakuhodo and the Evgeny, this one was so incredibly good that I had to take it too. The Yojiya is softer than the Hakuhodo and has more flexibility (due to slightly less density), not much but I do feel a difference, even without looking at the brushes, but just feeling the hair. 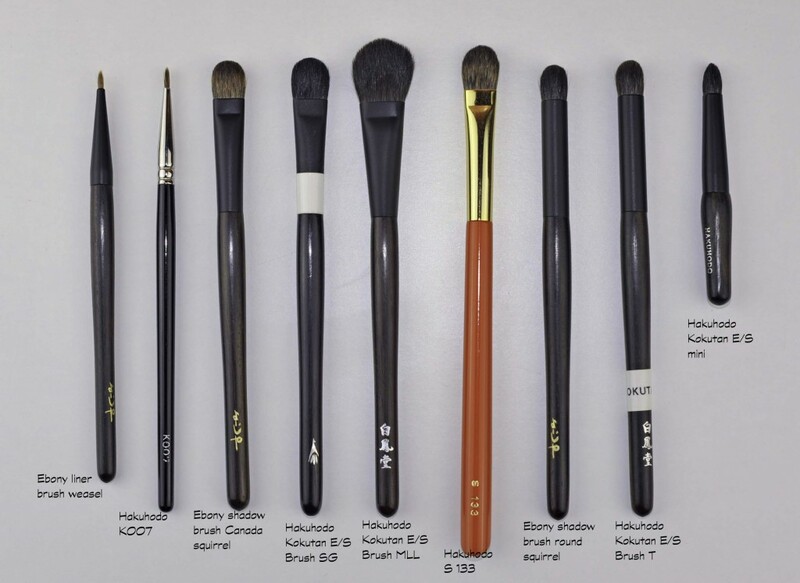 Since all the brushes are handmade, brushes can differ even if they are supposed to be the same. The Evgeny Polina has a longer head therefore offers more flexibility and is more easy for beginners but my fav of all 3 is the Yojiya. Below you will see the eyeshadow brushes I bought all together with some comparisons. The reason why they are all in one picture it’s just a problem with the time I had to prepare the pictures, unfortunately not enough to do it better. Eyeliners brushes are often too thin and too light for me to handle properly, I saw this brush and thought it would had better ergonomics for me, it definitely does. It is easier to maneuver, not too firm, not too floppy, 100% satisfied. It feels solid and much heavier than similar sized brushes, provides a lot of control, and to be honest with you, it looks gorgeous, we often are looking for beautiful blush brushes but a nice eyeliner brush can have a great impact too. I actually love this material for eyeshadow brushes, they allow control in the placement and are extremely soft. I find that they pick up more product than grey squirrel e/s brushes. Not as much as goat but the feeling on the eyelids is so much more pleasant than goat. The Hakuhodo SG is a mix of goat and synthetic, picks up more product but if you have sensitive eyelids you will prefer the Yojiya. 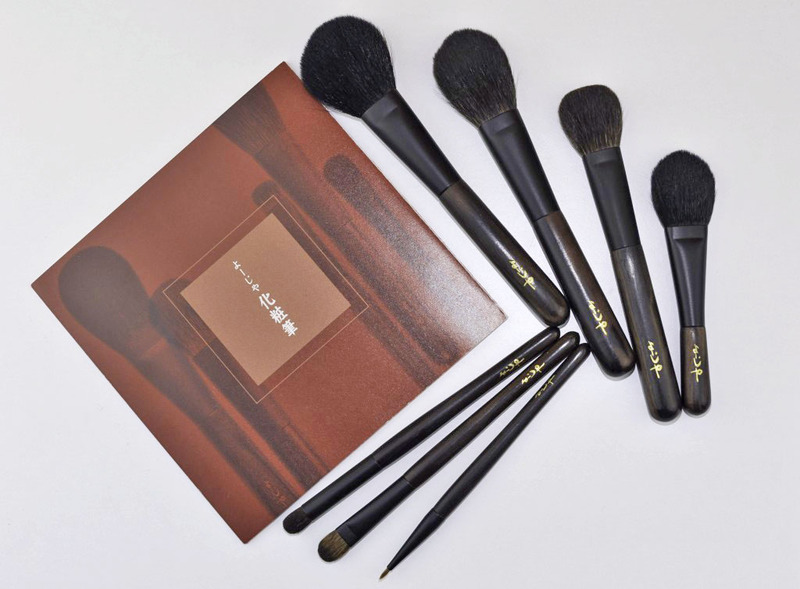 The Yojiya is thicker and has shorter bristles than the Hakuhodo S133 so it applies more product, with more precision and control but the softness is the same. The Yojiya is so similar to the Hakuhodo but it’s more flexible and feels slightly softer although you can barely tell. I use it a lot for placing darker colors in the outer V or along the crease before blending. I prefer the Yojiya but the difference is really tiny. I also show you here the mini one I got from Hakuhodo with the ebony handle, all the portable pencil brushes I own (that came in compacts) are not good enough and I experience fall out so I was looking for a real one but mini size. When I saw this one at the Hakuhodo manufacture I asked them if they could sell it separately for me, and they did 🙂 I use it everyday, either this one or the Hakuhodo G5520. The goat hair on this Chikumini is a bit softer than it’s Yojiya goat sister above. I got it because I was looking for nice portable brushes to keep in my makeup bag. It performs just as well as a bigger version. These two are both flatish brushes, the 12-1 is a squirrel brush therefore softer. I also got the little pouch, you can store 2 or 3 brushes in there, it’s a handy little pouch that doesn’t take too much space in your handbag. Bright Cleopatra gold ! I am very pleasantly surprised, I love them and I definitely recommend them, I already have the bigger ones in the Kokutan series so I didn’t take the big Yojiya ones and to be honest I don’t use them that much. I prefer smaller brushes that allow more precision and to finish I have the Radiance or kabukis or even little fans, I don’t find the bigger Kokutan or Yojiya brushes dense enough to buff the excess powder or to use as bronzer brushes and to set the foundation I just need a little brush, for me it wasn’t necessary that I splurge on the bigger ones just now. Yojiya goat hair is good quality although I prefer Koyudo’s goat because of my insanely delicate skin. When I was at the counter they let me chose the ones I wanted, the handles are all slightly different because of the wood. If you want to get them, it’s not going to be the easiest thing, the website is in Japanese and I don’t think they deliver internationally. You still have the option to grab them if you do to the shop, to use services like the ones from Tommy or Tenso. I tried both and had no issues whatsoever. 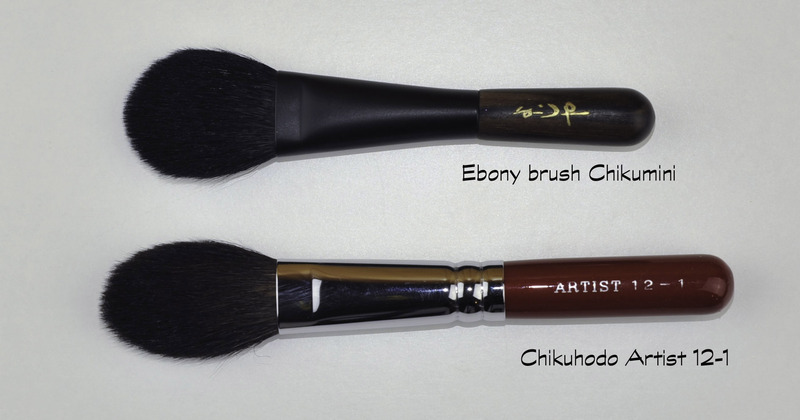 Yojiya brushes was last modified: September 24th, 2014 by Sonia G.
Just as I thought, I need the squirrel blush brush. Am I right that ‘teak’ google translated from Japanese means ‘blush’ and not the kind of wood? That actually makes a lot of sense, thanks! 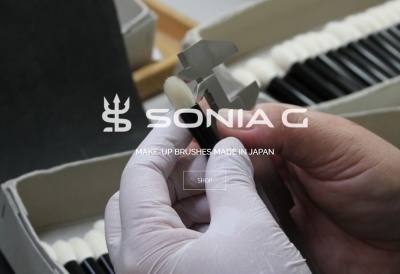 Sonia, if you were to choose between Yojiya Ebony Brush Chikurisu and Koyudo BP016 Cheek Brush, what would that be? 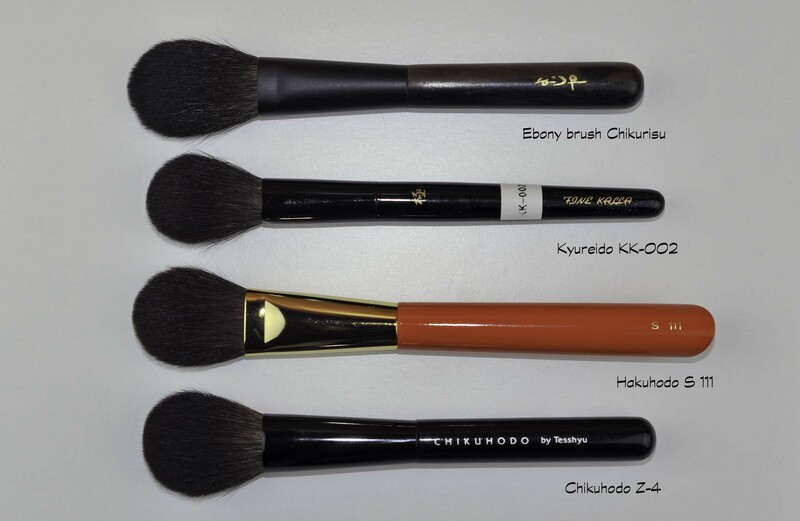 Provided you already had Chikuhodo Z 8 Blush Brush. lol yes that’s the one !!! what a fun coincidence ! The brushes look like they are of excellent quality, and I think I will very much enjoy the shorter handles! The wooden handles for these (and the kokutan) are so pretty….. since I am a blush “patter” I think I will love the first blush brush! Dont ask me how I did it but I managed to create an account in Japanese at Yojiya website. I even had to translate my name into Katanaka, I used the translator which I mentioned earlier on the shopping links section of your Forum. And it seems they accept my CC! Will place an order this wkend just to test it out and let u know if it really works. But of course I will go to the shop myself. Im also curious abt their famous blotting papers. Although I wont need them since Im never oily, but the packaging looks so darn cute! But hey…as you all know we’re shopping not because we NEED it right 🙂 Its just the insatiable hunger for anything beautiful in life! 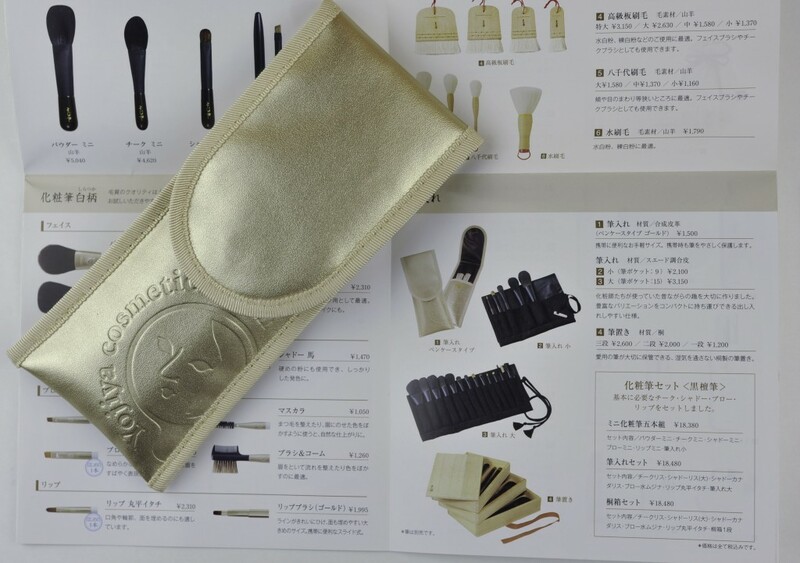 I have the Yojiya eyeshadow brush with tamage hair which Hakuhodo has stopped offering on the US website due to import restrictions. I have the Hakuhodo one and to me they are pretty much the same. I love the ebony handles. Just as lovely as stroking the brush hair lol. P.S. Melissa you kill me lol. 😀 ok, I can see you with your bananas and coke ! you did good Melissa, creating an account with them, waw ! Wow Melissa, way to go to create an account in Japanese! Very soon the Japanese brands don’t need international shipping or even sites in English at all, because we manage to hunt down what it takes to conquer the barriers! You are so right! Life is short, we should pursue everything that will nake us happy! @Sonia, that Kokutan ES Mini is the cutest brush I’ve ever seen! @Jeanette: I couldnt agree more with your Grandma!! I guess we all love the ‘challenge’ to get anything we want right! Its so rewarding at the end, then you look for a new challenge! @Melissa, thank you soooo much! This totally made my day. Did the account work? I am interested in buying brushes but I am having a hard time with the site. Did your order ever go through? Sorry I really want to know if it worked. i found some on ebay. here is the site if any of you guys are interested. it is a little more expensive but i hope the brushes are good. also you guys should try the yojiya loose face powder! i freaking love that stuff! i think its better than my chanel loose powder. Fun! 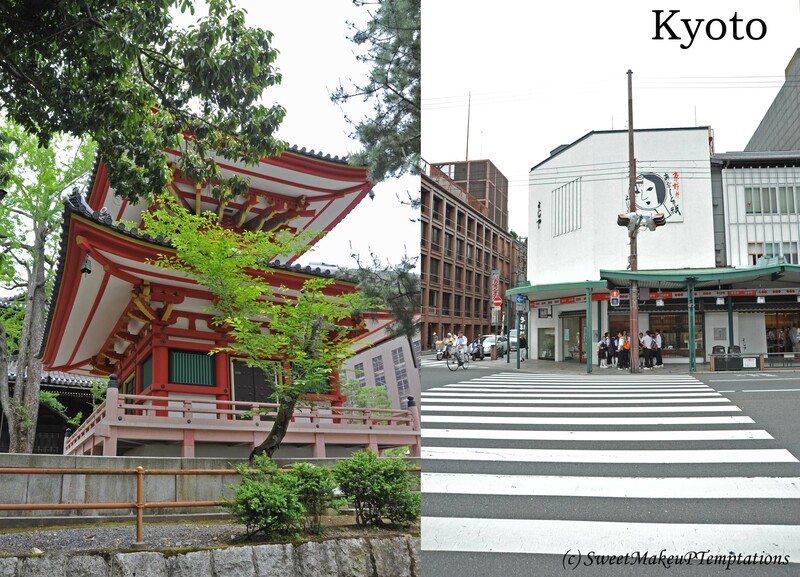 They look a lot like the Hakuhodo kokutan don’t they? (“Kokutan” is actually Japanese for “ebony”.) I love the “yojiya” script! The yojiya is very nice!!! How stupid am I to pass on Yojiya when my brother went to a store to buy my mum souvenirs in Kyoto. 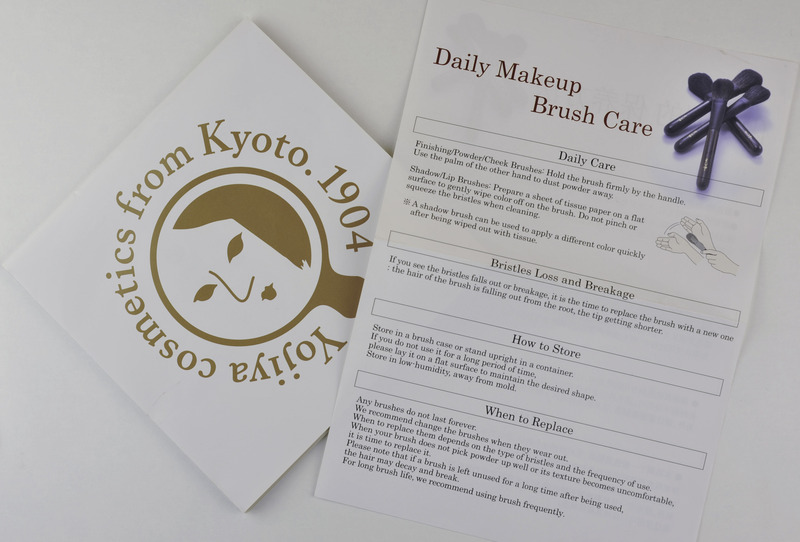 I browse through its website after your trip info, and there are so many accessories and brush tools (e.g. wodden box) there, very lovely. Your collection qualify for a makeup brush exhibition. Hi Nikoleta, missing you ! take care of yourself ! I really love the little pouch <3 Ideal for the handbag!